Expressing the belief that Saint Lucia’s latest murder victim was not a “Saint”, a relative of the deceased is of the opinion that the associates the deceased kept would have contributed to his death. 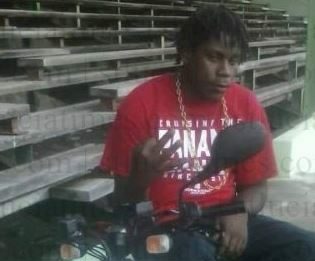 The relative, who spoke on condition of anonymity, said that Windry Cole, also known as ‘Fat Boy’ was gunned down Thursday afternoon just a short distance from where he lived on Waterworks Road, Castries. “I wouldn’t say he was a Saint,” the relative said. The relative expressed the view that persons with whom the deceased would hang out would have been a factor in his murder. Windry Cole, whom the relative said lived alone, was shot multiple times. According to eyewitness reports, he was in the company of two other males when a vehicle pulled up and one of the occupants opened fire. Cole was hit and fell to the ground, whereupon the gunman came out of the vehicle and pumped several more shots into the victim, it was reported. Cole’s two other companions had fled the scene after the first gunshots were fired, the eyewitnesses said. Th relative said both the mother and father of the deceased are abroad. Cole was in his late twenties, the relative told St Lucia Times. I’m actually shocked they would allow photograph of deceased throwing ms13gang sign,I’m sure they could have found a more appropriate picture when speaking of deceased individual,but as the story goes,in any event it explains why.the expression a picture tells a thousand words. Say it like it is; i believe you! but help find them!